This aerial photograph by Marco Garcia seems to show some kind of oil slick, or chemical spill covering the landscape, a stain perhaps, but not an urgent threat. Yet, the faint wisps of smoke reveal the true nature of the material. It is lava, slow moving, and yet seemingly unstoppable. Kilauea has been erupting since 1983, but lava has recently burst forth from a new vent, forcing residents of the Hawaiian village of Pahoa to evacuate. "You never realise just how close you are to it," says Garcia. 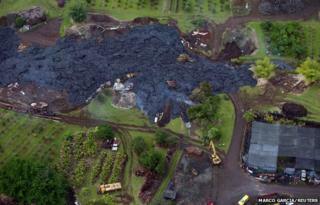 "When I first arrived, I saw black smoke billowing not so far in the distance - the lava had struck a pile of car tyres. When it burns, it's quite amazing. It's mesmerising. "The most challenging part of shooting the lava is that police keep you away for your own safety. The closest you can get is about 200m (650ft), so after getting approval from the Civil Defence Authority, we hired a helicopter and flew above it." This simple scene of predominantly green and black is a picture that draws you to the detail. The remains of vehicles being digested by the mass, the neat rows of vegetation that belong to the village, and of course the small ant like human figures who seem powerless. "On the ground, there's intense sadness among the community because people here know their village will be destroyed but no one knows when," adds Garcia. "They're distraught. Everything will be gone and there's nothing they can do about it - they can't build a wall, or dig a hole. The lava will destroy everything and all they can do is watch."